Award-winning documentary Final Solution, which looks at religious rioting between Hindus and Muslims, has been banned in India. 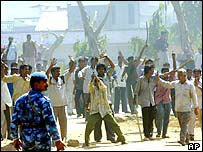 The film follows 2002 clashes in the western state of Gujarat, which left more than 1,000 people dead. A censor board said the documentary was "highly provocative and may trigger off unrest and communal violence". The movie was honoured at the Berlin Film Festival. Director Rakesh Sharma plans to challenge the ruling in court. India's Central Board of Film Certification imposed a comprehensive ban on the film's public screening, stating: "State security is jeopardised and public order is endangered if this film is shown." "The board also says that the film will affect friendly relations with some neighbouring countries and that the film attacked the basic principle of the Indian constitution, which is national integration," director Sharma told the BBC. 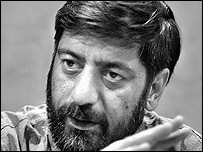 The director dismissed the censor's concern as "hogwash". "People who make hate speeches should be banned and not the film-maker who records it," he said. Final Solution follows the riots which broke out after 59 Hindus were killed in an arson attack on a train in February 2002, blamed on a Muslim mob. But the film was not permitted a screening at the Singapore film festival in May, after its censor board deemed it "potentially inflammatory".